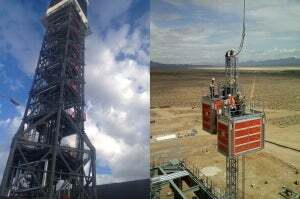 Three Alimak construction hoists were used to build three 140m solar receivers/boiler towers at the Ivanpah solar generating facility in the Mohave Desert, US. Ivanpah is the world’s largest solar thermal power plant currently in operation. The Alimak machines provided efficient vertical access for both men and materials on that site. Three Alimak Scando 650 passenger and material hoists with dual hoist cars were used during the construction of three 140m solar receivers/boiler towers at the Ivanpah Solar Generating Facility in the Mohave Desert. With a payload of 3,200kg (7,100lb) and a lifting height of 140m, the Alimak hoists provided efficient vertical access for both men and materials during the construction of the solar receivers/boiler towers. Working with Bechtel Power and Bechtel Equipment, Alimak Hek performed an engineering evaluation and specified the Alimak Scando 650 FC 32/32 II system for this project. Travelling at 54m/min, the hoists have a 1.5m x 3.2m x 2.3m car size and a 3,200kg (7,100lb) capacity, which was more than sufficient to transport site workers and bulky palletized materials to working height. The Alimak machines were anchored to structural steel at approximately 12m intervals and the mast was allowed to extend 12m above the deck for access when the modular components were hoisted. The strength of the Alimak mast made this possible. The Ivanpah solar power facility is the world’s largest solar thermal power plant currently in operation. The project is located in Ivanpah Dry Lake, California, US, on more than 1,600ha. The station will produce 390MW of electricity for more than 140,000 customers of Pacific Gas & Electric Company and Southern California Edison by using more than 173,500 software-controlled heliostats (mirrors) that will track the sun in two dimensions and reflect sunlight to the three boilers that sit atop of the towers. The high-temperature steam will then be piped from the boilers to a turbine were electricity is generated. For more information, please contact Alimak Hek.